In my living room I have a little 222 liter with small fish like tetra, barbs, rasbora, small cichlides and some livebearering species. It is funny to breeding tetras and small species, many of them in the picture is born in my aquariums. 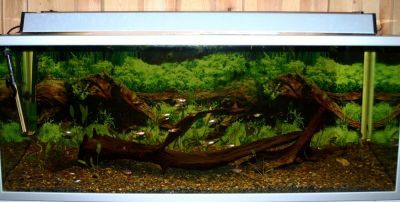 In the living room in the basement I also have a 310 liter i often before was using for as storage aquarium for tetra and small species I want to breeding. Today I am using these 172 liter chines made aquarium for this purpose. This aquarium have curved front glas with much tension and I know about a aquarium of same type where the glas crack and gave much water damage in the flat. So this aquarium is going to stay i the basement where I can take away the water if it crack down with out to much damage. 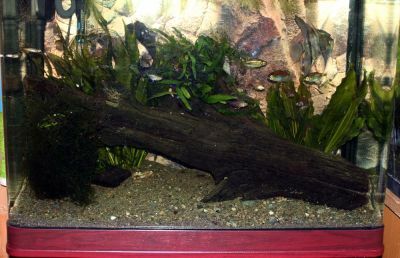 In the living room in the basement I also have have two of this 530 liter aquarium I am using for my wild Discus. 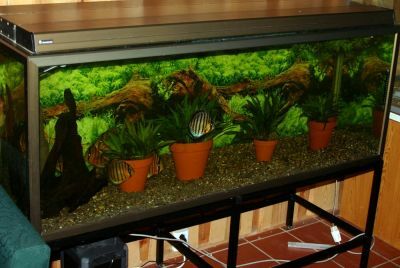 In the basement I also have a smal aquarium room with today 15 aquariums, total of 4000 liter water for my wild Discus. Today, there have been 35157 visitors (90884 hits) on this page!